There was a time when integrated amplifiers were considered compromised, compared to the more fancied, and dearer, separate pre-amp and power amp combinations. But is that still the case? Over the past few years, an increasing number of top-class integrated amplifier designs have proved that they can stand their ground against separate pre/power offerings. The Cary Audio SI-300.2d is a good case in point. Its objective is to deliver the performance of a pre-amp/power amp combo from a single-chassis design. 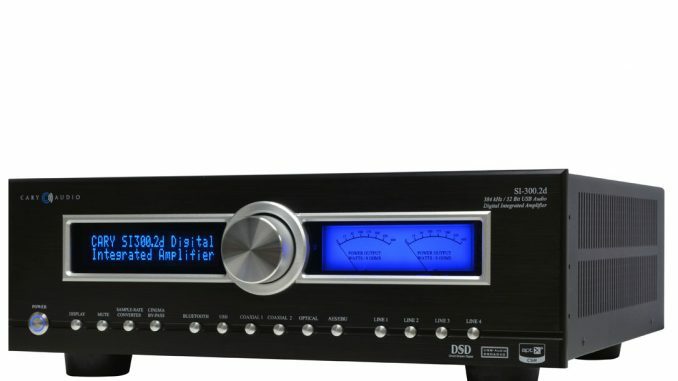 But it adds an extra spin to the integrated amp ball by including a digital-to-analogue converter, thus further extending the unit’s capabilities (and reducing the number of boxes in your hi-fi rack). Reassuringly solid, the all-metal SI-300.2d looks and feels the high-end part. Its no-nonsense styling focuses on functionality, with a central volume controller, an LED alphanumeric display on the left, and old-school but charming VU meters on the right. An illuminated power button is joined by a long row of round pushbutton controls on the lower edge of the faceplate. The top panel has vents for the internal, integrated heatsink. That said, the Cary doesn’t run all that hot – just pleasantly warm. The rear panel provides an overview of this integrated amp’s versatility. It caters for four stereo analogue inputs – two XLR, two RCA – and a raft of digital inputs: AES/EBU, Toslink optical, 2x coaxial and a USB Type B. Two antennas allow for Bluetooth and Wi-Fi respectively, and there’s also an Ethernet wired network option. This network connectivity allows for the use of a neat iOS/Android app, which makes source selection, volume control, display brightness and source selection even more convenient than using the supplied remote control. However, it doesn’t allow for access to and streaming of source material from network-attached storage devices, which seems like an opportunity missed. The Cary offers a set of pre-amp outputs for those who want to upgrade to a separate power amp. And there’s also a choice of Toslink or coaxial digital outputs. The Cary is a pretty sophisticated piece of kit, and a powerful one, too. Rated output is a healthy 300 watts RMS/channel into 8 ohms, and 450 watts into 4 ohms from the amp’s solid state Class A/B circuitry. On the digital front, a two-channel AKM AK4490EQ 32-bit D/A converter offers upsampling up to 768 kHz/32-bit PCM and DSD256 (11,2 MHz.) A 128-bit DSP engine is used to upsample the digital input signal from native resolution and bit depth in selectable steps. In the case of 44,1 kHz native res, the steps are 48/88,2/96/176,4/192 kHz, as well as 352,8 and 705,6 kHz, all at 32-bits. The Cary will also upsample to DSD64/128/256. For input signals operating in 48 kHz steps, the upsampling options are 88,2/96/176,4/192/384 and 768 kHz, again all at 32-bit, as well as the three DSD options. You can also bypass the upsampling completely and run with the native resolution and bit depth. The Cary’s sonic talents are pretty much in line with those solid, no-nonsense looks – it delivers a bold, full-blooded and arresting sound that immediately gets you to sit up and take notice. Running our Lumin D1 network player into the Cary’s balanced inputs, the Punch Brothers’ The Phosphorescent Blues (Nonesuch 96/24 FLAC) sounded astonishingly vibrant and lifelike. There was a visceral intensity to the music that endowed voices instruments with body and presence. On ‘I Blew It Off’ the violin, cello and banjo sounded lifelike and incisive, weaving a textured, tonally vibrant backdrop against which the vocals were vividly presented. The percussion had tremendous impact and precision, emphasising the effortless pace of the delivery. Tonal range was expansive: the amp’s muscular, intense low frequency delivery underpinned the music’s timbre and authority. I was struck by the dynamic intensity of the sound, and the ability of the Cary to explore both the explosive and the subtle, intimate elements of the music. But perhaps the most appealing, the most arresting part of the Cary’s performance was the imaging: the amp’s ability to create a lifelike, convincing performance was underscored by a real talent to present a finely delineated, thoroughly three-dimensional sound picture. As a result, it was easy to recognise the specific spatial and temporal positioning of each instrument and voice on an open, seemingly infinite soundstage. I’d be a fool not to admit that the review system’s Vivid B1 Decade speakers played a key role in this seamless, precisely rendered and musically enthralling sound picture, but that said, they were a perfect match for the Cary’s urge, speed and outright musicality. This was particularly apparent on the slick, immaculately produced eponymous album by Fleetwood Mac stalwarts Lindsey Buckingham and Christine McVie (Atlantic/Warner 44/16 FLAC), which can sound almost too glossy and bright on some systems, but which was presented with just the right amount of impetus and heft here. On the catchy ‘Red Sun’, I was again struck by the generosity of the staging and the precision of the imaging, as well as the fullness of tone and the overall intensity of the music. The sound wasn’t rich in a bloated, rolled off, oversaturated way, but would be best described as full-range. The amp certainly has the muscle and the authority to prevent the sound from becoming unruly, but never gets in the way of the music’s inherent energy and flow. On the Dunedin Consort’s slightly austere but no less compelling rendition of Mozart’s Requiem (Linn Records 192/24 FLAC), the amp accurately rendered the recording’s spatial intimacy and precise vocal placements, while also exploring the slightly drier tonal character of the period instruments. The fine balance between soloists, chorus and orchestra was perfectly maintained throughout. Switching to the Cary’s own DAC via the D1’s coaxial output, the sound was slightly clearer and more precise, and also appeared to gain a little bit of extra breathing space. However, the midrange also sounded a little leaner. The lower registers retained their urge and authority, and imaging was finer, adding even greater focus. Staging was expansive, but the dimensionality was slightly less defined as far as depth was concerned. I experimented with the Cary’s upsampling feature, but found that the results varied too much from recording to recording to be conclusively better at any given sampling rate. There were gains in some areas and compromises in others, compared to the native mode, which to me sounded consistently best and most balanced throughout. Upsampling to DSD appeared to offer greater precision, but sometimes at the expense of the music’s character. Deciding on an upsampling rate will most probably depend on personal preference, although the differences are often subtle. The Cary SI-300.2d is a triumph – an integrated amp with extensive facilities that allow the use of a variety of sources, and a sonic approach that makes the most of the incoming signal, regardless of whether it’s analogue or digital. The ability to upsample the digital signal allows further flexibility, while catering to different sonic preferences. The amp delivers so much urge, with so much finesse, that it’s hard to imagine why one would want to add an extra power amp – but the pre-outputs leave that option open, too. The Cary proves just why high-end integrated amps have become so popular. Its spread of talents is so convincing, both musically and technically, that it should meet the demands of even the most fastidious audiophile with confident and compelling ease. A versatile, visceral, powerful performer that never loses sight of the music’s emotional intricacies. Riveting when paired with source components of equal quality.